One of the comments you’d never see in a professional book review is “The book is graphic enough to appeal to high school guys.” I hate to admit it, but this is something I think about when I’m reading. Research shows–and anecdotal evidence at Colony High backs up that research–that high school boys rarely read, almost never when they have the choice. This summer I read a great book–and I mean great in every sense—a literary masterpiece, a stunning work of fiction, an insightful look into a bleak future, a beautiful rendering of the father-son relationship. And–ta da–a book graphic enough that it will appeal to high school guys. 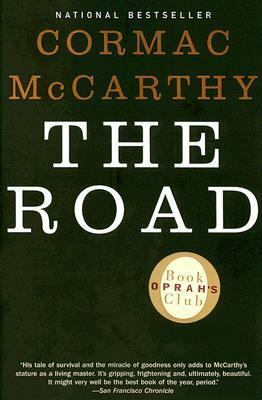 The Road by Cormac McCarthy is the story of an unnamed father and son who are making their way to the sea in a post-apocalyptic world. “A long shear of light and then a series of low concussions” have left the world barren. Animals are dead (or long ago eaten by the few remaining people), plant life is scorched and roads are melted. The air is always gray with ash, as is the snowfall. The sun is blotted out and winter arrives early. All living people are scavengers—and with little left to scavenge, most are cannibals as well. In a world that is virtually hopeless, it is amazing that McCarthy can wrench the heart of his reader with the love of the father and son. The father has often told the son that they are “the good guys” and while they have to be on a constant alert for others (who might capture and eat them), they would never do such a thing themselves. Though starving and exhausted from their trek, the son reminds the father that the two of them “carry the flame.” The son always wants to do well, including helping other people. The father knows better and is more wary. Understanding that he is dying, he saves two bullets in his gun so that he can take his son with him. Some of the situations McCarthy envisions are horrific (people imprison others and eat them limb by limb, cauterizing the amputations) and yet all strike the reader as inevitable in such a world. Too often, I’ve read reviews that describe a new novel as a ‘tour de force.’ After reading the book, I assume that the reviewer was the author’s best friend. The Road is one novel that deserves the praise. This entry was posted in Fiction, Movie Tie-In, Sci-Fi/Futuristic and tagged Cormac McCarthy, future dystopia. Bookmark the permalink.